Luxury vehicles have pioneered many of the features that have become standard on vehicles in subsequent years. This is especially true of safety features — many of the modern safety features included in today’s cars started as optional features for luxury vehicles. Once the automotive industry recognized the increased safety benefits of each product, however, they soon started adding these improvements to every vehicle model. In the 1960s, adding a headrest to a seat was an option, not a requirement. Headrests were originally designed for comfort on luxury vehicles, but it was soon discovered that they could prevent whiplash and other injuries in a crash. 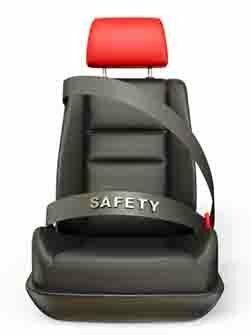 Once vehicle manufacturers determined the safety benefits of the headrests, all vehicles were required to include them after 1969. Until 1927, vehicle windows and windshields were made of common glass. When the vehicle was in a crash, the glass shattered dangerously into sharp shards that posed a significant risk to the occupants of the vehicle. Carmakers got wise and started adding tempered and laminated glass to luxury vehicles in 1928. Today’s vehicles only use tempered or laminated glass to protect the occupants in case of a crash. Airbags were first introduced in the 1970s and GM was one of the first car manufacturers to start offering them in their vehicles. But most drivers still did not use seatbelts in the 1970s, so airbags really were ahead of their time. Frontal airbags have been standard in all passenger vehicles since 1998, and in SUVs, pickups, and vans since 1999. 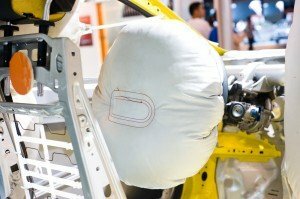 Today’s vehicles have a variety of airbags to help protect everyone in the vehicle during a crash, including front airbags and a variety of side-impact airbags such as curtain, tubular, door-mounted, seat-mounted, and combo. Although no one likes to see their car’s siding crumble in an accident, there is a reason for the design. Crumple designs help absorb impact in a crash, preventing the force from damaging the occupants of the vehicle. The concept of the crumple zone was invented by an engineer at Mercedes-Benz in 1953 . By 1967, the idea was implemented with the Mercedes Heckflosse. Today the protective crumple zone is built into even the smallest of vehicles and continues to help reduce the effects of a crash. While it’s common in modern cars, traction control wasn’t introduced until the 1970s. Buick offered its version, called MaxTrac , as an optional upgrade in several of its luxury models in 1971. Today’s vehicles come equipped with a wide variety of anti-slip and traction features that make everyday driving safer. Most systems are derivatives of the limited-slip differential. Standard traction features on modern cars include reduced wheelspin, anti-lock breaks, engine timing, and throttle control. This helps drivers stay safe in adverse weather and driving conditions. If you’re curious about what safety features you can expect cars to offer in the next decade, take a look at what’s already built into luxury vehicles. Just like in the past, many innovative safety features are tested on high-end cars before they are introduced across all vehicles. Nate Miller is an occasional guest poster on car repairing and is a full-time car enthusiast. He currently represents Parts Geek, the best source among online auto parts stores for finding the widest selection of automotive parts & supplies.